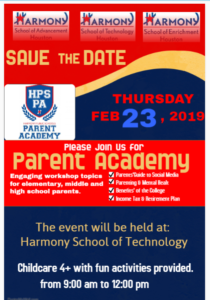 It is with great delight that I announce the first ever HPS Parent Academy at Harmony School of Advancement, Technology, Enrichment on Saturday, February 23, 2019. Since we believe that each child is an individual of great worth, our parents need to be integral partners. We know that parents have a huge impact on their children’s lives and are in fact their children’s first and most important teachers. The HPS Parent Academy is a district initiative that strives more directly engage parents in their children’s education and prepare them to provide the support needed in order for the students to be more successful in school. It is our hope that as you attend Parent Academy sessions, you will gain valuable information regarding diverse tools, strategies, and resources that help nurture student’s academic, social, and emotional development. On behalf of our organizing committee, I look forward to a wonderful time of learning and networking with you and other parents. (Childcare will be provided -4 years and older, please see the details in the link below). Please contact Mr. Ersoy at iersoy@harmonytx.org if you have any questions.